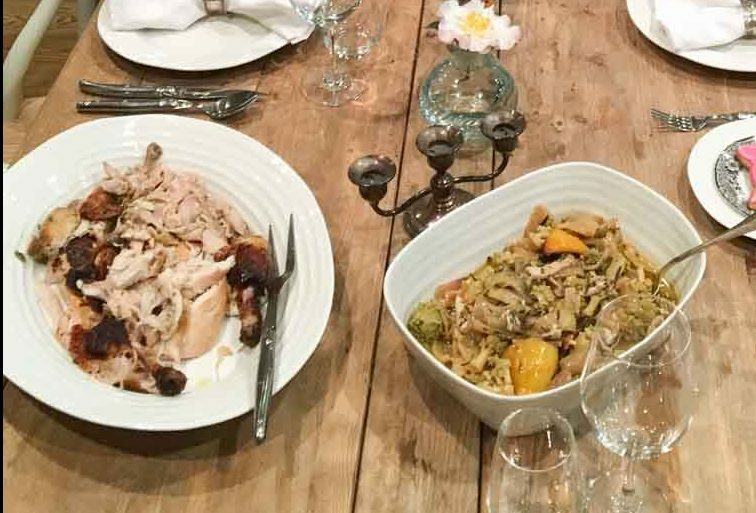 If I were to draw up a list of 10 healthy recipes that everyone should know how to cook this winner winner chicken dinner would be on it; a simple roast chicken that’s juicy and full of flavor and almost impossible to get wrong and easy to get right every time. 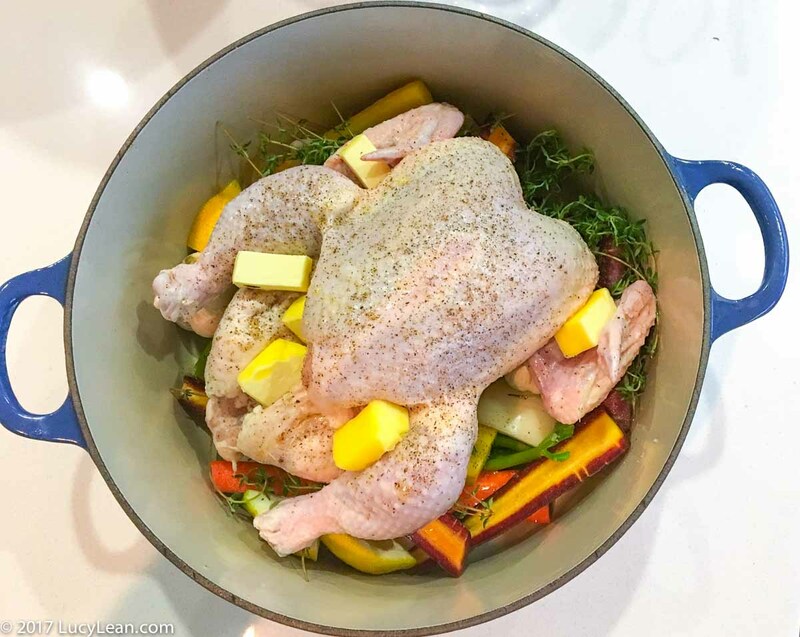 Based on a French classic – Poulet en Cocotte – Chicken in a Pot – is a family favorite, especially given how quick and easy it is to prepare. Last night was the Academy Awards which meant I didn’t want to spend hours in the kitchen preparing our family Sunday supper but wanted to watch this year’s winners. This took all of five minutes to prepare and then cooked away as we watched the show. There really isn’t much to it beyond popping the seasoned bird in a pot with some vegetables and into the oven for just over an hour. The resulting chicken isn’t as pretty to look at as say the rotisserie chicken with its golden crispy skin but the meat is just as juicy and the flavors as good if not better. The chicken cooks in its own juices which enhances the depth of roast chicken flavor. As with all recipes where there are few ingredients it’s doubly important to source great ingredients. I bought this chicken at McCalls on Hillhurst. My bonus was chatting to owner Nathan, one day soon I’ll get him and his wife over for dinner and we can cook together. As with lots of one pot cooking, the vegetables take on the chicken juices and flavor and a rich gravy is made with the juices at the bottom of the pan. I use celery, carrots and onions but feel free to mix it up with whatever you have – parsnips or cauliflower would be good. The other night we had it with romanesco, lemons and onions. I was given this blue le Creuset cast iron dutch oven as a wedding present by my friend Mike Eisner nearly 20 years ago. I like to think that this is the second best thing he gave me – the first being his wife Margot, one of my best friends. It has many uses – bread making being it’s main purpose these days – but I have cooked many soups, stews and braised meat dishes in it. Once the chicken and vegetables have been removed, carved up and served I like to add boiling water to the pot with the striped carcass and cook on a low heat for about an hour to make the most delicious chicken stock. This can then be used in soup or stews, perfect for making Tom Colicchio’s chicken noodle soup recipe from Made in America. Preheat oven to 450 F and move shelves so dutch oven can sit near to the bottom of the oven. Rinse the chicken well under cold running water and pat dry. 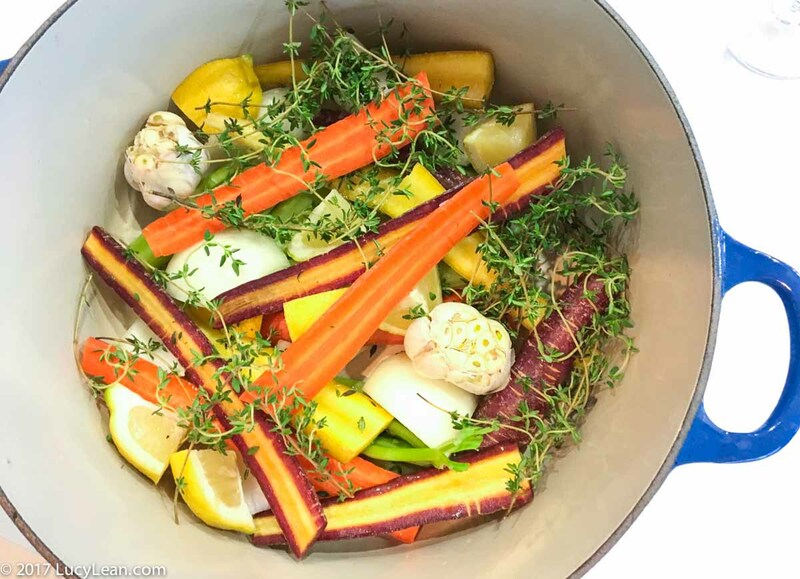 Place the onion, carrots, celery, carrots, shallots, garlic and thyme into the bottom of a large dutch oven with a small amount of olive oil. Season the cavity of the bird with salt and pepper, a few sprigs of thyme and 2 of the lemon pieces and rest on top of vegetables. Season everything with salt and pepper and drizzle more olive oil over and dot with butter. Cover with lid. Roast in the oven at 450 F for 15 minutes. Lower heat to 300 F and roast 1 hour more, or until chicken is cooked through and the meat is almost falling off the bone. Serve with mashed potato or rice and surrounded by the vegetables. Ladle extra juice over the chicken. 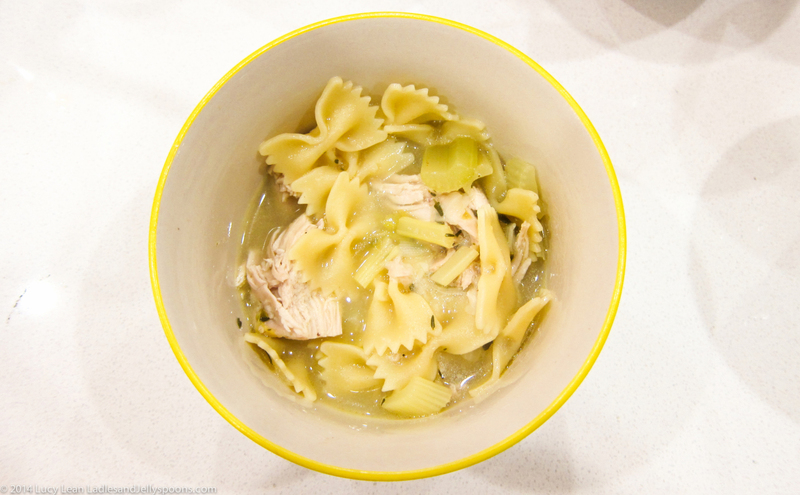 Cover remaining juice and carcass with water and cook for at least an hour to get the best chicken stock, perfect for making Tom Colicchio’s chicken noodle soup recipe from Made in America.